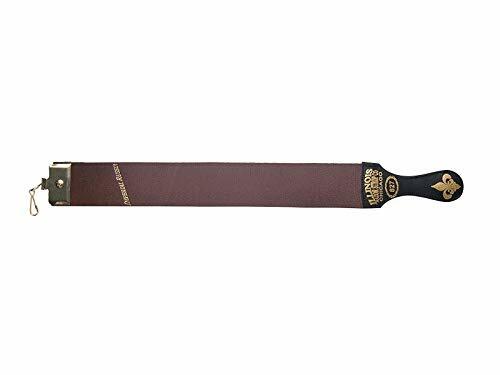 Fromm Illinois Razor Strop, IRS127, 2.5 x 23"
GBS High Quality Leather Strop 2.5" X 23.5" Barber's Razor Strop Cow Hide, Dual Straps with Swivel Clip. Makes a Great Addition for Any Straight Razor Shaving Set! 100% Satisfaction Money Back Guaranteed! - We devote ourselves to provide the best customer service and bring the best shopping experience to every customer. If you are not satisfied with our product, please contact us and we will find a solution! Can be used for sharpening woodworking tools and other fine edges and blades. Leather will not remove any steel from the edge. The green solution to disposable blades. Great decorative item or commemorative gift. Warranty: All Fromm Products carry a Lifetime Guarantee against manufacturer defects. From will repair or replace defective products at no charge. Simply return the product to Fromm with sales receipt. 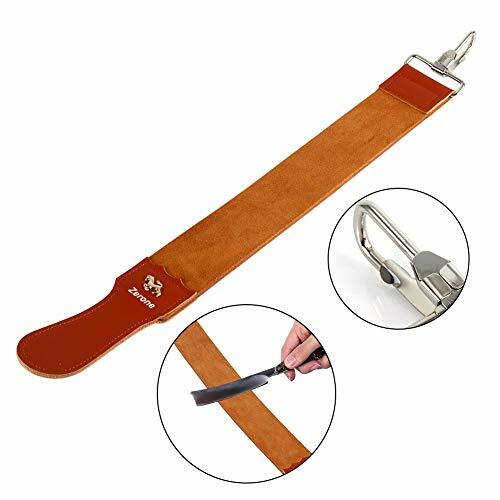 Description: This double sided leather strop is ideal for sharpening straight razors and most knives. One side is coarse and the other is fine. One end are joined by hanging hook with lobster clasp, which is convenient to be hanged to someplace. The other end with handle is easy to grip while sharpening your razor. 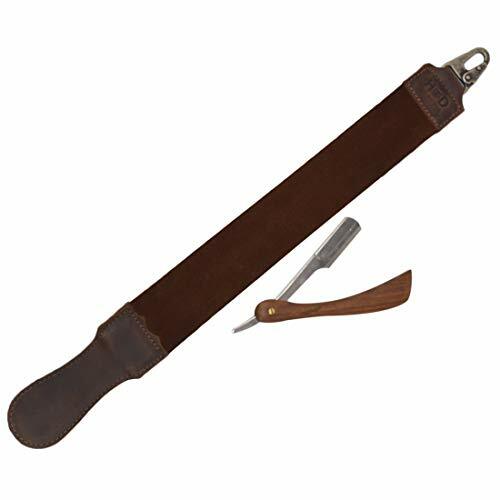 You can enjoy smooth shaving experience all the time with this leather strop. Features: 1. Genuine leather is durable, soft and stylish. 2. Used for final sharpening and smoothing after honing razors. 3. Suitable for straight razors, sharpen knives and chisels. 4. Hanging hook with lobster clasp is convenient to fix during use, which is suitable for professional or home use. 5. Coarse and fine sides can meet your different needs. 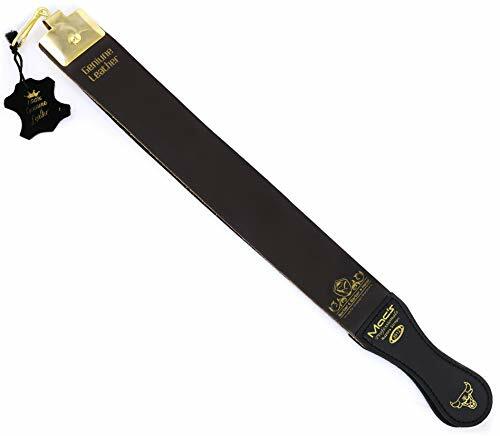 Specifications: Material: Leather Color: Brown Size: 50.2 * 5.2cm / 19.8 * 2.0inch Weight: 115g Type: Strop Function: Sharpening and Smoothing After Honing Razors How To Use: 1. Fix the front end on someplace with lobster clasp. 2. Hold the other end with one hand, and rub the razor on it back and forth with putting your strength on the back of the razor. Package Includes: 1 x Leather Strop (Not Including the Razor) Notes: 1. Please allow 1-3cm error due to manual measurement. Thanks for your understanding. 2. Monitors are not calibrated same, item color displayed in photos may be showing slightly different from the real object. Please take the real one as standard. Reasonable Design Genuine leather is durable, soft and stylish.Coarse and fine sides can meet your different needs. Widely Use Used for final sharpening and smoothing after honing razors.Suitable for straight razors, sharpen knives and chisels. Easy to Use Hanging hook with lobster clasp is convenient to fix during use.It is easy to use and suitable for both professional barber shop and home use. 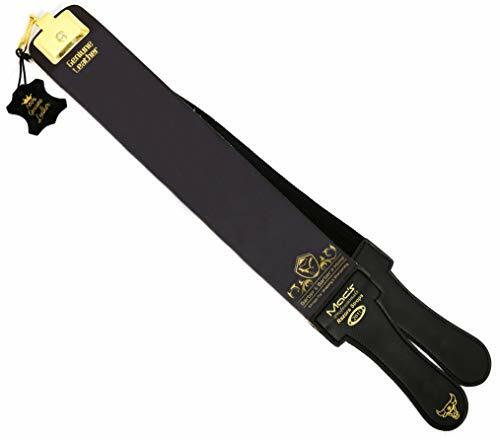 Protect Knife Can be used for sharpening most knives, will not remove any steel from the edge. Protect knife and long term usage. Size 50.2 * 5.2cm / 19.8 * 2.0inch.With Strong Hanging and moveable hook. Matched with EXCELLENT wood to make a great razor-that's what we do. Every razor is honed by professional grinders before it goes out of the factory. Only manual honing will get the blade sharp enough and not harm the blade edge. Each ZY straight razor is handmade and quality checked. If it has any problem,feel free to contact us. Delivery within 24 hours, about 5-7 days you can receive the goods. Luxury Shaving Kit to meet your High grade taste. This set gets almost all of your needs for your daily shaving job. Grandslam select best angle for most comfortable feeling and improve uncommon taste. 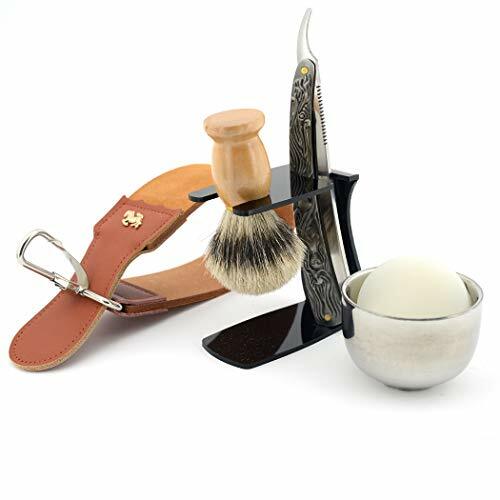 100% brand new and good quality,treat yourself to an old fashioned shave with shaving tools. 2.Used for final sharpening and smoothing after honing razors.Suitable for straight razors, sharpen knives and chisels. 3.The razor sharpening strap is made with best quality cowhide leather which allows for smoother shaving blades. 4.The razor sharpening straps are finely balanced to allow for an easy sharpening experience. 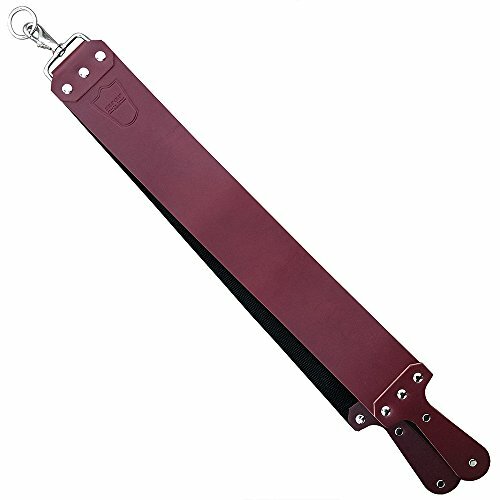 The strop has a handle at the bottom and swivel hanging tab on the top end for ease use. 5.Package Included:1 x Razor Sharpening strop strap Only. Stropping is more of a fine-tuning process that helps keep the edge of your blade sharp between uses. 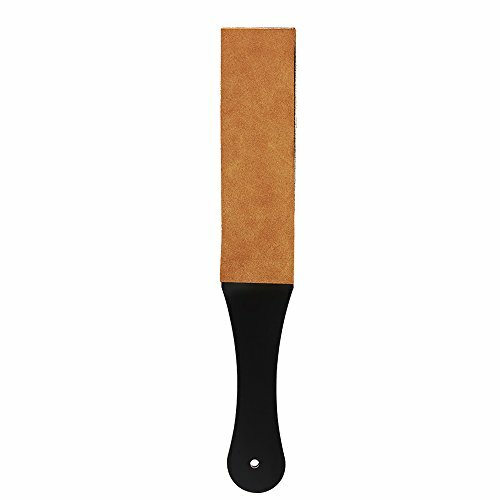 You strop on the leather surface, not the rough leather bottom, but you use the very top of the strop. Stropping is a motion that pulls the cutting edge of a blade away from a strip of leather in order to sharpen the blade. It's a great method of keeping a razor clean and easy to use as it produces a very sharp final edge. Stropping helps smooth the rough edges off your blade and sets the teeth in alignment-it gives a straight razor a keen edge to help make shaving easier. Hanging strops are the most common. They consist of a canvas strap and a leather strip. DRAW BLADE AWAY- Always draw the blade away from the cutting edge so that the razor doesn't dig into the leather. BE CONSISTENT - Hold the razor at the same bevel angle consistently throughout the stropping process. DON'T ROLL THE EDGE- Please don't raise the angle up or lower it down, you will destroy the edge. 100% satisfaction or your Money Back Guarantee!! Professional choice: 20.4 in length and 2.55 wide leather strop. Stainless steel pivot hook ring makes sharpening easier than ever! Shaving starts with a good razor and your new stropping kit. This strop will help you keep your blade sharp and strong for years to come. Our American Made Leather Strop is an ideal complement for your straight razor. It uses high quality grade Latigo leather which has been cured for the perfect draw. Our strop is accompanied with a twin strop made of a webbed polypropylene fabric that was designed for polishing or drying your razor. Both strops are joined with modern hardware and durable paddle handles that allow you to create the perfect amount of tension. Hide & Drink's exquisite products are handmade by expert artisans using beautiful Full Grain Leather, giving you a product that will last you a lifetime. Includes a 101 Year Warranty, so if this product breaks within your lifetime, then we'll send you a replacement for free Hide & Drink is a vertically integrated community-driven brand dedicated to support the local community in La Antigua, Guatemala. Our product is designed, sourced, and manufactured by local artisans for the benefit of local residents. Our wages are fair and we emphasize for-profit development through entrepreneurial education. In addition to creating jobs through the manufacturing and sale of our products, we contribute 5% of our Gross Profits to outstanding non-profit organizations in Guatemala. A TOUCH OF THE PAST WITH CLASS: Hide and Drink's Leather Shaving Sharpener is a barbers best friend and will keep them looking professional day in and day out. The strap can be used to sharpen any size straight blade, and will keep client's shaves straight and smooth. Once a staple of the corner barber shop, the resurgence of barber shop shaves make this full grain leather sharpener a nostalgic and classy blast from the past. Please note: Your purchase does not include razor pictured. HIDE & DRINK'S 101 YEAR WARRANTY: Each one of Hide & Drink's rustic, durable leather products is made with care and craftsmanship, with every item handmade to the highest standard. Our confidence in our belts knows no bounds, so we include each belt that you purchase with a 101 Year Warranty. We aim for nothing but 100% satisfaction when it comes to our products, so if you're not satisfied, just get in touch with us and we'll help you as quickly as possible. HANDMADE FROM SOFT & ATTRACTIVE FULL GRAIN LEATHER: All of Hide & Drink's products are hand cut and handcrafted using the highest quality of leather that you will find, namely Full Grain Leather. The quality of this leather ensures a long-lasting life and durability. After time and use, the leather will attain a beautiful and unique patina that will show age and grace. FINELY HAND STITCHED: We are proud that each and every one of our products is handmade by expert local artisans of Pastores, Guatemala, a town wholly dedicated to the crafting of leather goods. Each item is hand cut and finished with a fine stitching method than not only looks good, but also makes for a durable finish that will give you a lifetime of use. Any loose ends are passed over with an open flame to ensure no unravelling during its lifetime. MAKES A GREAT GIFT: Hide & Drink swears by its leather, and knows that this fine, rustic Full Grain Leather product will make an excellent gift for friends, family and loved ones. Built to last a lifetime, this item will make a thoughtful, long-lasting gift for anyone and everyone. A straight razor (should) be Beautifully HANDCRAFTED Made from the FINEST MATERIALS possible Stand behind a PROMISE to provide great service Matched with EXCELLENT wood to make a great razor-that's what we do. Every razor is honed by professional grinders before it goes out of the factory. Only manual honing will get the blade sharp enough and not harm the blade edge. Luxury Shaving Kit, All Premium Material : all-in-one kit, covering needs for a decent, traditional shave. Ideal Gift Idea, gift packed : girls, stop thinking over and over again of gift for boyfriend, father or business partner, for anniversary, birthday, father's day! A decent gift to business partner and so on. Every time he shaves, your love is there anywhere in the air. 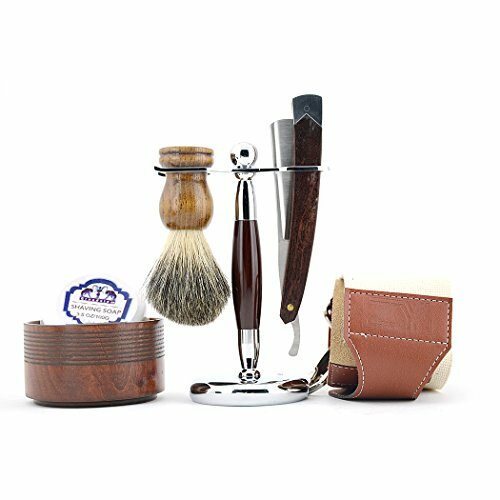 Fine Craftsmanship Grandslam adopts premium badger brush with acrylic stand to let dry, finely carved shaving razor, rich-foam soap and bowl, and indispensable leather sharpening strop. Sharp Blade, enjoy Shaving Shave matters in grooming. Foaming the soap and spread evenly on the face for 10min, the beard get softer. And start shaving, the Ultra sharp Gladslam blade make shaving fun. Life Time Warranty/Instruction : If you have any problems using this kit, contact us anytime. Please sharpen the razor in one direction after certain time of use, and it will be as sharp as new. Great helper to keep straight razor and folding knife sharpen, make shaving activities easier. Double-side design, meeting your different razor & knife sharpening demands. Made of high quality leather, promise you a long service lifespan. Handmade acrylic handle is designed for comfortable holding. Suitable for both professional barber shop and home use. 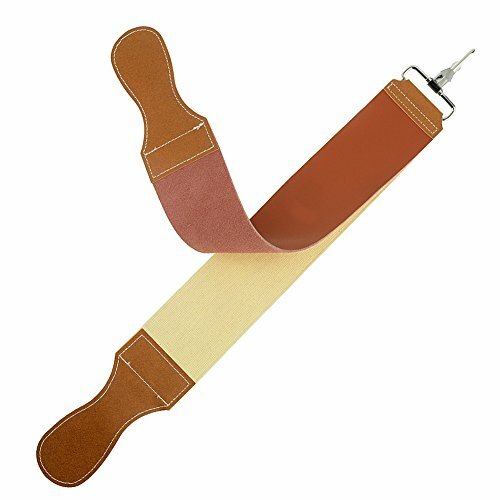 This double sided leather strop is ideal for sharpening straight razors and most knives. One end are joined by hanging hook with lobster clasp, which is convenient to be hanged to someplace. The other end with handle is easy to grip while sharpening your razor. 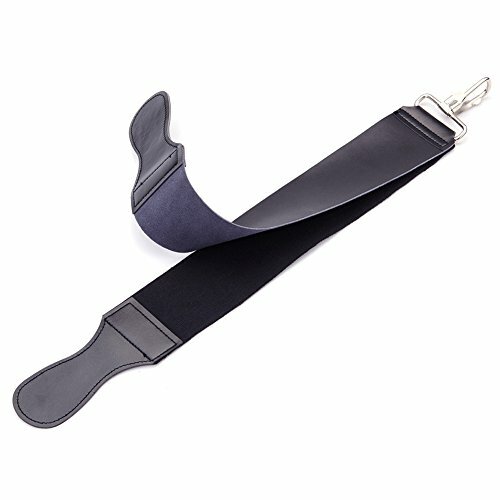 You can enjoy smooth shaving experience all the time with this leather strop. Use a strop that is about a foot long and a few inches wide. If the strop is too long, it's hard to control it, and if it's too short, you have to keep repositioning the razor, which can lead to uneven sharpening. Count the number of strokes you make-start with 15 to 20. If it's still not sharp, strop on. You can see the effect of stropping by noticing the black marks of metal that have come off the blade onto the leather. Exercise care while you are stropping so you don't cut yourself, and try not to over strope-blades can only get so sharp. Durable, soft and stylish leather razor strop. 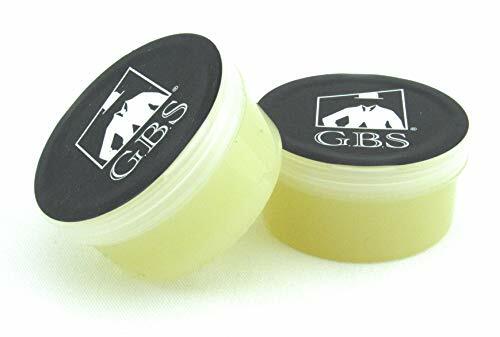 GBS has its exclusive line of fine grooming products. The GBS line offers classic shaving tools and specially formulate grooming products for modern men of all ages. GBS proudly offers high quality craftsman shift and exquisite style at an affordable price! We are constantly testing and improving our products every day to make them better. Our specially formulated products include: Balms, oils, cologne, shower gel, shaving soaps, and many more. Our Tools are used by professionals Barbers across the USA. Barber Tested and Approved! We Stand by our Products 100% because our products well made and extremely durable. With Proper maintenance and care our grooming tools and products will last many years! EASY SHAPING EXPERIENCE-the razor sharpening straps are finely balanced to allow for an easy sharpening experience. the strop has a handle at the bottom and swivel hanging tab on the top end for ease use. WIDELY APPLICATION-used for final sharpening and smoothing after honing razors.suitable for straight razors, sharpen knives and chisels. PREMIUM MATERIAL-the razor sharpening strap is made with best quality cowhide leather which allows for smoother shaving blades. 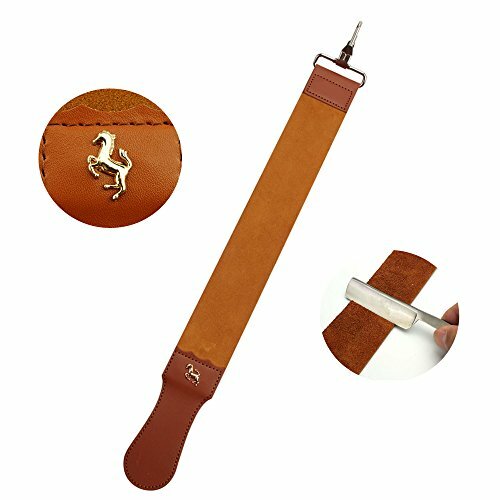 PACKAGE INCLUDING-1pc durable, soft and stylish leather razor strop. DOUBLE SIDES DESIGN-one side is coarse and the other is fine. coarse and fine sides can meet your different needs.